Those with gardens tell me that there is still rhubarb growing aplenty and so although it is strictly a springtime crop, I hope I will be forgiven for bringing it up in June. Aarstiderne has some very simple and delicious 'rabarber' recipes and so I thought I would share with you one that I've translated, tried and tested: rhubarb trifle. If this is already a favourite of yours then with a bit of a twist, this recipe can be adapted to make a compote that goes beautifully with savoury dishes such as chicken and fish. However, before going on, I just wanted to pass on a snippet of rhubarb trivia: if you've ever wondered whether rhubarb is a vegetable or a fruit, then it turns out it does have a bit of an identity crisis. It is strictly a plant that falls into the 'vegetable' category although it is mostly used as a fruit and finds its way into pies and cakes. 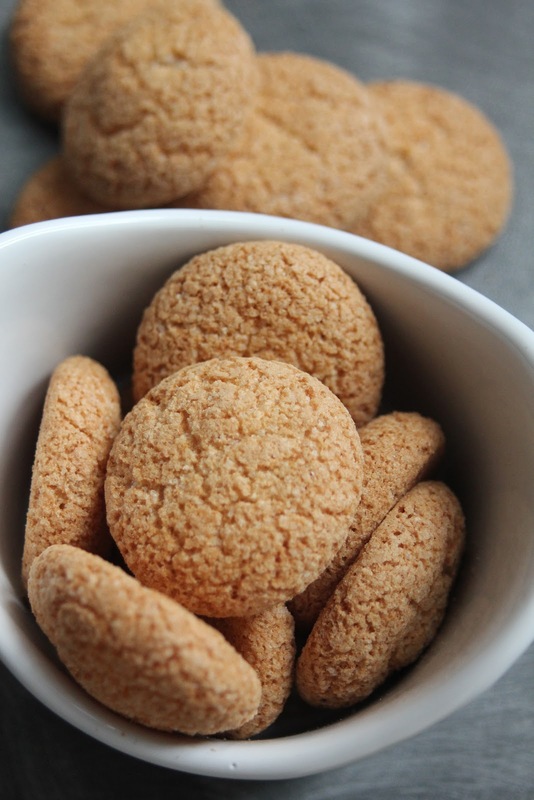 Of local interest to those readers in Denmark, 'rabarber' gave its name to a neighbourhood in Northwest Copenhagen where poor people would cultivate it and reap the harvest several times a year. It is a relatively new edible crop and when it was first grown here 150 years ago it was considered a humble food for the 'proletariat'. Some have even said that rhubarb is best when it is red, 'as the classic social democrat once was'. That's an awful lot for a simple plant to have on its conscience! Now, however, rhubarb is enjoying a renaissance and is fashionable once again with everyone. Half the vanilla pod lengthways. Scrape out the seeds and put them to one side (you will use these for the cream). 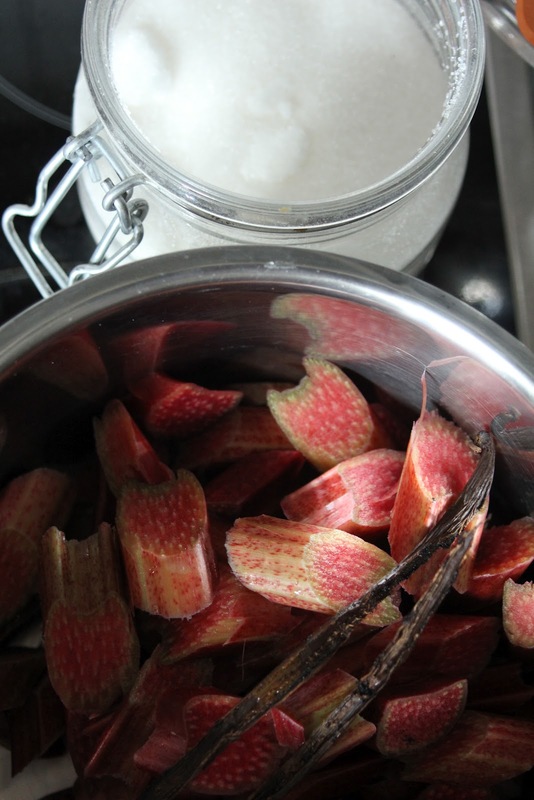 Wash the rhubarb, top and tail it and then chop the stalks into pieces about 1-2 cm long. Place the chopped rhubarb, the sugar and the vanilla pod into a pan. There is no need to add water as rhubarb has a very high water content. Let the mixture come to a boil, this should take a couple of minutes and then leave it to gently cook. The recipe I used said that it should cook for a couple more minutes, another said 15 minutes and another called for even longer. I kept a close eye on it and after about 20 minutes on a low heat, it was a beautiful soft consistency. I didn't add any further sugar although you could add more for individual taste. Then leave the mixture to cool. I used macaroons for the base of the trifle but 'sponge fingers' would work equally well. 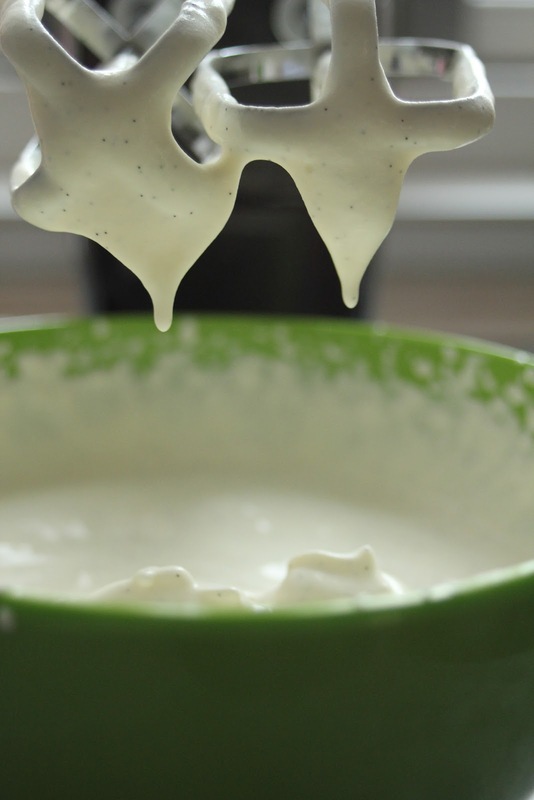 When you're ready to assemble the desserts, whip up the cream together with the vanilla seeds. 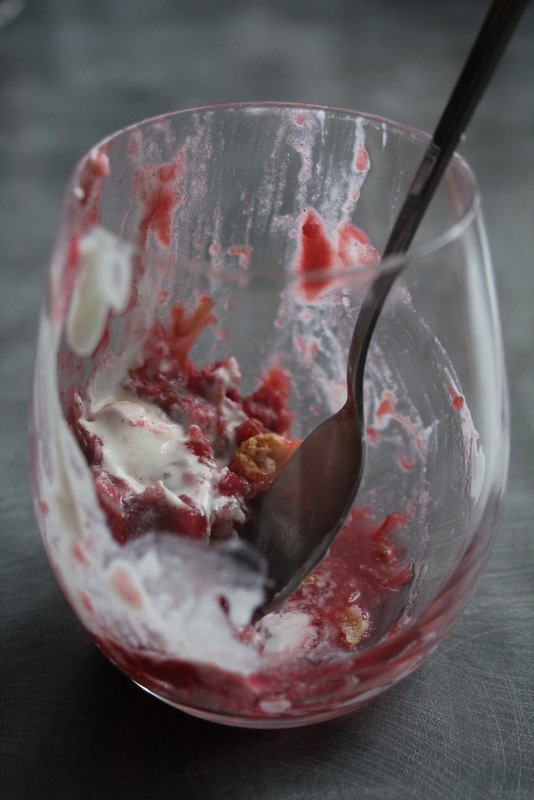 In an individual glass or bowl, put broken up macaroons at the bottom, some rhubarb on top and then finish off with vanilla ice cream and the whipped cream. 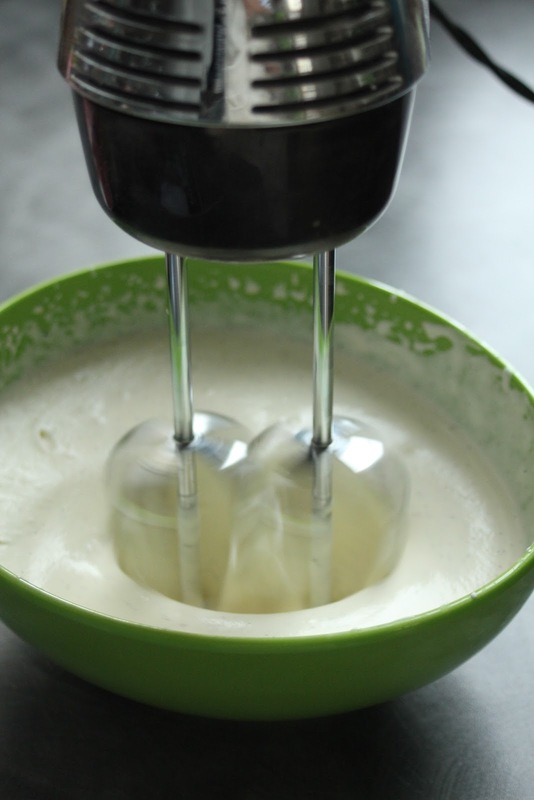 All too often we add sugar to cream in desserts but there really is no need to do so. The beauty of this recipe is that the subtle flavour of the vanilla cream takes the edge off the rhubarb. As for the textures, what's not to love?!!! 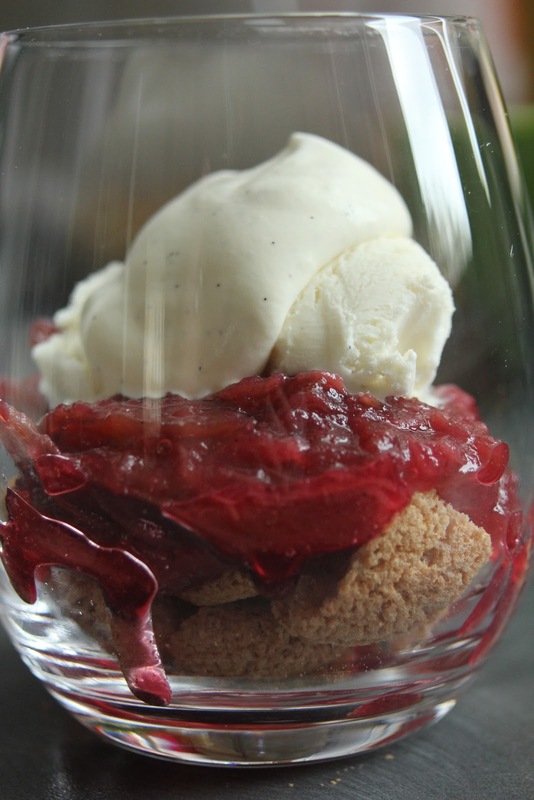 From trifle to compote: with only a slight variation, this recipe works for a compote too. Using 500 g of rhubarb and 300-400 g sugar, put these in a pan with 1 or 2 vanilla pods chopped up into small pieces and mixed into the rhubarb. Again, it shouldn't be necessary to add water or the compote will be too thin - let the mixture come to a boil and then cook slowly on a low heat for about ½ to 1 hour until the juice boils off. Keep a close eye on it and be careful that it doesn't burn. Take it off the heat and let it cool.